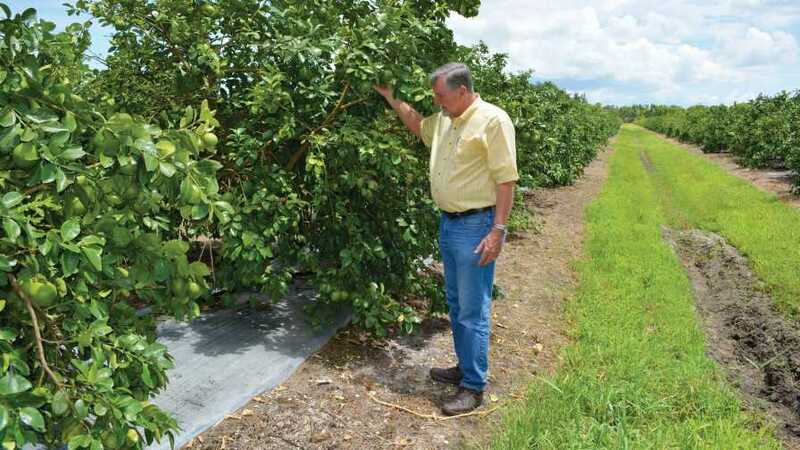 Bob Adair, Florida Research Center for Agricultural Sustainability Inc., inspects a tree planted on metalized reflective mulch. After more than four years, the mulch is still intact. 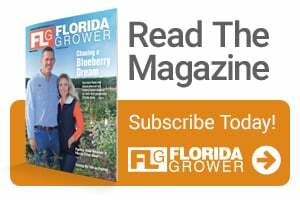 For 30 years, Bob Adair has tested novel ideas in producing citrus at the Florida Research Center for Agricultural Sustainability Inc. in Vero Beach. He is particularly excited about a recent project testing the viability of using metalized reflective mulch in citrus plantings. While plasticulture is not new in vegetable production, it is a novel idea in citrus. Plasticulture in vegetables began in the mid-1950s. Today there are as many as 2,500 square miles of agricultural lands that use plastic mulch across the globe. Using a highly reflective surface came a little later, and vegetable growers have been successfully using it to deter pests. 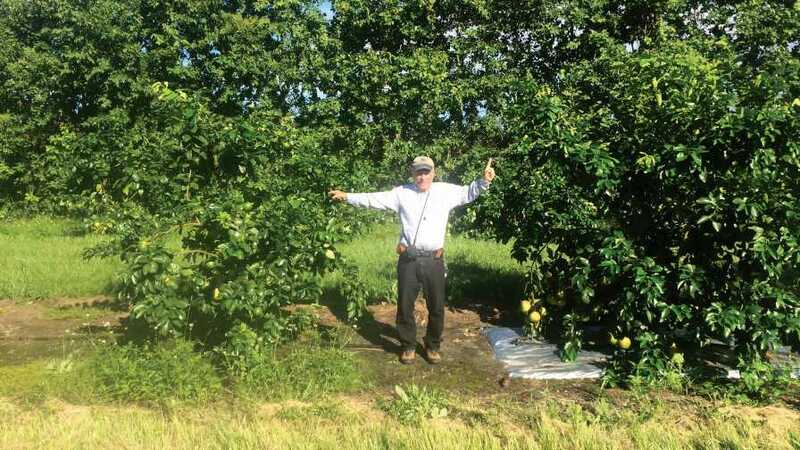 Adair and his co-investigators from UF/IFAS wanted to test the hypothesis that metalized reflective mulch could deter Asian citrus psyllids (ACP) in new plantings and, thus, keep HLB levels lower in young trees. The idea came from Phil Stansly, a longtime entomologist with UF/IFAS. 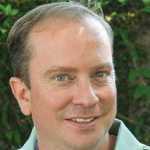 Fellow UF/IFAS entomolgist Scott Croxton also worked on the project because of his experience using metalized reflective mulch to deter whiteflies in tomatoes. Adair’s son Matthew has done a lot of the fieldwork and data collection over the life of the project, which is now in its fourth year. The study covers a 10-acre grove and compares three systems — bare ground, compost, and metalized reflective mulch — each laid out in a checkerboard pattern with 100 trees in each plot and replicated five times for each treatment. ‘Ray Ruby’ grapefruit were planted on sour orange rootstock. All treatments received the same post-plant horticultural practices for sprays, fertilization, and irrigation. All applications were made in accordance with UF/IFAS recommendations. “This was an exhaustive and vigorous layout consisting of 1,500 trees,” Adair says. The 6-foot-wide metalized reflective mulch maintains a foot on each side tucked in the ground to secure it, leaving a 4-foot surface exposed. Proper mulch installation is important to its effectiveness and longevity. The mulch used in the trial was Shine N’ Ripe, manufactured by Imaflex. It is heavy-duty, 3-mil, totally impermeable film coated with highly reflective aluminum that reflects more than 90% of solar radiation for three years or longer. Proper preparation includes getting rid of as many potentially germinating weeds (nutsedge in particular) as possible. This is not easy in Florida, but it’s an important step. Adair’s team tilled the seed-bed for the metalized reflective mulch extra times and applied additional herbicide applications and a burn for hard-to-till weeds. He then used a rotavator, followed by a roller, to firm up the bed prior to laying down the metalized reflective mulch. The metalized reflective mulch was laid under the supervision of Croxton using a Kennco bedding machine. The goal is to lay the film out as flat as possible. The film is 6-feet wide, with a foot tucked in the ground on each side, leaving a 4-foot surface. 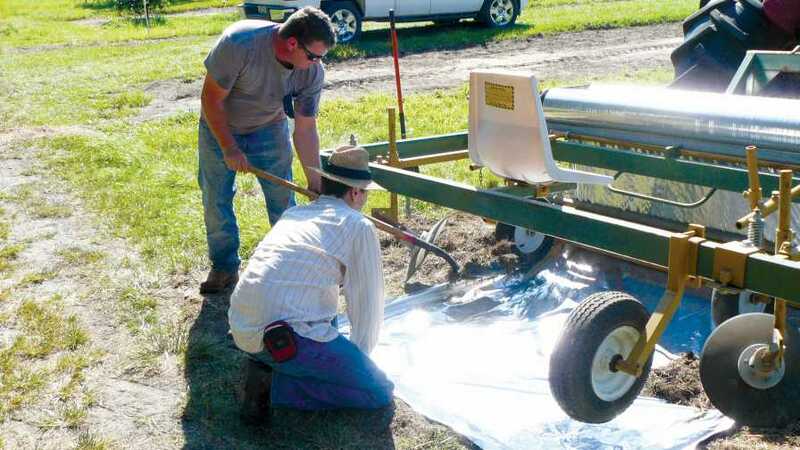 In future plantings, Adair plans to use an 8-foot film to increase the surface area to 6 feet. The holes in the film were cut (in a plus pattern) with box cutters to avoid stretching or tearing the plastic. Holes were dug, trees planted, and film laid back over the area. “We were again surprised how little trauma was done to the film in the laying and planting process,” Adair says. Irrigation tubing was set on top of the film and utilized two drip emitters (2 gallons per hour) tucked under the plastic on the north and south side of the trees. UF/IFAS entomologist Phil Stansly shows the growth difference between trial plots of bare ground (left) and metalized reflective mulch (right) at 3.5-year-old citrus trees. 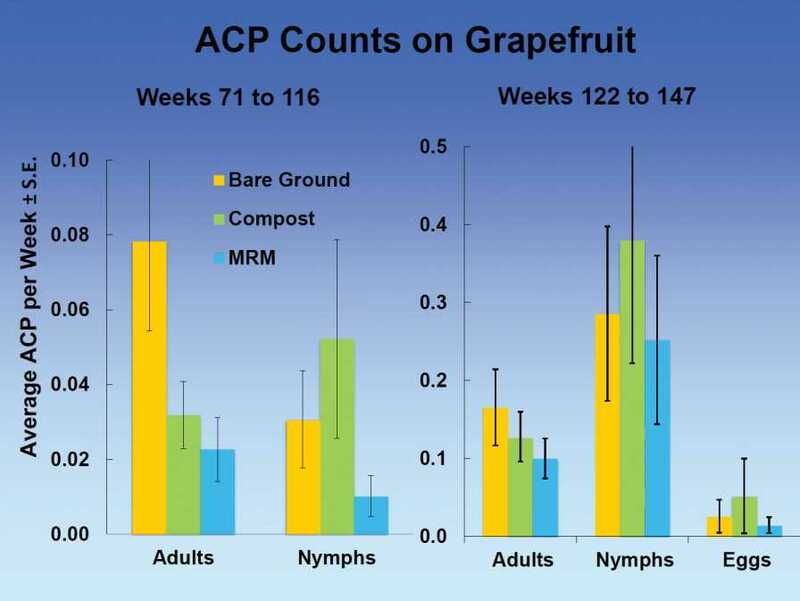 While the metalized reflective mulch trial primarily sought to find if the practice would reduce ACP populations in young plantings, data collected on tree growth and yield of trees showed surprising results. The trunk caliper size illustrated the growth at 165 days after planting. The MRM trees had a 57.6% larger caliper than trees planted on bare ground. Fruit yields were double at the 21/2-year mark when compared to bare ground, and nearly triple a year later. Adair used an optical fruit sizing machine developed by Brian Boman, an agricultural engineer with UF/IFAS (retired), to size and weigh each fruit from 80 trees, in each treatment, to collect a large amount of meticulous data. “Another exciting surprise was the realization that the MRM was protecting roots from Diaprepes [root weevils] when we scouted and found lower populations under the mulch,” Adair says. The mulch also appears to be protecting roots from potential systemic herbicide damage. And, while no data was collected on this, Adair says there are numerous studies that show the reflection of infrared light reduces soil temperatures and creates a more habitable rhizosphere for roots to grow. The compost applications added an additional $75 per acre compared to bare ground, while the additional herbicide treatments and other applications brought the total MRM costs to $706 more per acre than bare ground. Annualized over three years, the cost of the MRM is $235 per acre, and over four years, the cost is $176 per acre. An added benefit — because of the plastic cover — the system requires less fertilizer, water, and herbicide after planting the trees.